We received some of these games for review purposes. As always opinions are honest and solely mine. This post contains affiliate links which means I will earn a small compensation if you purchase something through them at no additional cost to you! Win-win. When I say we are a family of gamers I’m talking board games! I know, not what you were thinking. Don’t worry, we love video games too. In fact, I’ll be posting some fun video game finds in a few days. Today though, I will be sharing a few games that have made us happy over the year as well as a few that have made it onto JustaBXgirl’s rather extensive Christmas List. With the weather getting colder we’re all looking for more reasons to stay inside. And seeing how I live in a really small apartment I am always looking for ways to avoid going stir-crazy or JustaBXgirl and her cousins arguing because nobody has personal space. 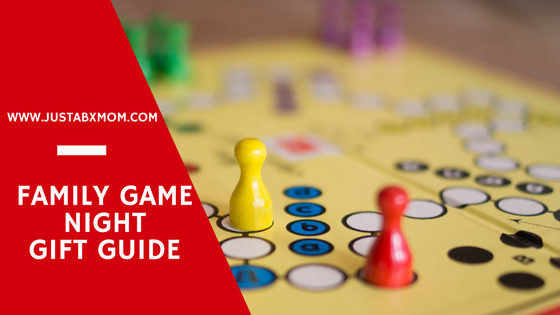 Board games keep the family busy and entertained without using screens. And when her cousins aren’t over JustaBXgirl sometimes plays board games with her toys. Only children problems I tell ya! I used to do the same as a child. Boom Blast Stix– Boom Blast is the perfect name for this game because it definitely goes BOOM and you have a blast playing. Be prepared to scream the first time you play. It is a lot of fun for all ages. JustaBXgirl really thinks the point is to try to cause the explosion and who am I to change her mind. Safe Breaker– Can you break into a safe? This game will have you trying to open the safe before the other players. You even feel like a professional safe cracker by listening to the safe through a stethoscope. The difference is you’ll be hearing number clues instead of moving tumblers. JustaBXgirl had a little trouble concentrating on this one but the over eight crowd seemed to enjoy it. Snow White– JustaBXgirl is pretty good at logic games and my nephew is AMAZING at them. When I found this gem at Blogger Bash over the summer I just knew we would have to add it to our game shelf. The characters are so cute that I have trouble getting JustaBXgirl not to start playing pretend stories with them. The puzzles go from really simple to ones she needs help completing. Balloon Bot Battle – When I played this at an event I just knew I needed it for my house. The amount of fun and laughter that comes from popping your opponents balloon just can’t be measured. Now, this is how you compete at a family fun night. Smaller littles will need help preparing their fighter but this is fun for everyone. Doggie Doo– I have to admit. I didn’t want anything to do with doggie doo but JustaBXgirl has been asking for this since she saw it a few months ago on a YouTube video. Her and her cousins can’t get enough of making the doggy go. I will admit it is fun. And what little doesn’t like something involving gas and poop? Break Free – Can I tell you this game is difficult? The red puzzles take more time than the littles in my life will allow me! Still, I’m always up for a challenge and they don’t seem to be too difficult for the tweens and teens in my life to solve. JustaBXgirl loves that she can slip in and out of the cuffs without opening them up! Happy Salmon – JustaBXgirl gets really loud and excited when we play this. I mean really loud. I bet if you listen carefully you might be able to hear her screaming HAPPY SALMON in your living room. I’ve loved this game since the first time I played it about a year and a half ago. I was excited to add it to our game collection. Pie Face Sky High– My nephew used to bring his Pie Face over to challenge JustaBXgirl. Well, my precious princess has now upped the ante and is challenging her cousins to Pie Face Sky High. Which is your littles favorite version of the game?